The first step in our process has been interpreting the City & County of Denver Zoning Code that defines general building design elements, the location of structures, setbacks, and vertical height requirements. 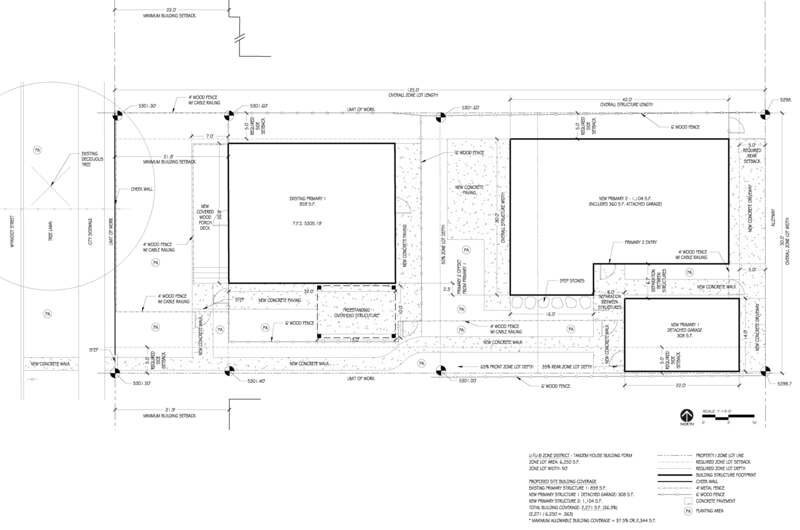 The code has guided our process over the past few months–working towards the goal to develop site plans and elevations that meet qualifications for zoning permit review. The review by Denver’s development services staff ensures compliance with the standards and provisions outlined in the Code. Eventually, when these plans are approved we will receive appropriate zoning and building permits. We began this stage by testing different building configurations to maximize the allowable footprint and challenge it against programmable wants and needs for the site (i.e. garage space for both front and back houses, outdoor spaces, and a flexible building form that encourages the functional use of space). Intermittently we shared our site plan study with staff reviewers during City permit counter walk-through hours. At each meeting, planners were able to validate whether or not our layout complied with set forth standards. We went through this process several times until we settled on a building configuration that we felt confident in developing further. Below is the configuration that we have settled upon. Called out in the plan are required front, side, and rear setbacks as well as the 65%/35% Zone Lot Depth line. This boundary line determines the bulk height plane in which structures in the front 65% of the lot are limited to 30-foot height restrictions and the back 35% to a 24-foot height limit. For many developers it is the Zone Lot Depth Line that makes the side-by-side duplex zoning configuration more attractive because you can put two 3-story homes at the front of the lot, thus maximizing total square footage. Versus the limitation of tandem house zoning that restricts the height of the back house to only 2 stories. Other zoning parameters to point out is the structure length of New Primary 2 that we maxed out at 42 feet long. Structure width is allowed at 32 feet that we limited to 30 feet because we maximized the 37.5% allowable building coverage of the site. Because the Primary 1 garage is detached, the 5-foot side setback does not apply and therefore we are able to push the structure out towards the property lot line. The configuration creates space between Primary 2 and Primary 1 detached garage to form a secondary entry from the back alleyway. Private landscape space is programmed at the front and south side of Primary 1 and Primary 2 landscape space is between the two primary structures. Along with the above site plan, we are also required to submit as part of the permit review, a demolition plan, building elevations, and site survey which we are currently developing. And, in congruence with these plans, we have proposed the below site re-configuration to be considered by the County Assessor in dividing up the lot into separate land ownership. 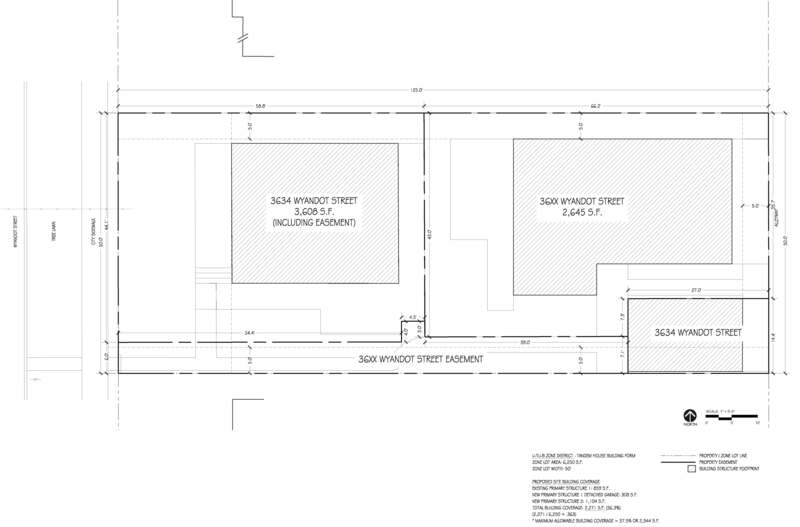 The proposed easement will be owned by 3634 Wyandot but will, for legal purposes, allow utility use for 36XX Wyandot. We are excited about our initial progress and our next steps include developing interior floor plans and exterior architecture through 3D Revit modeling.